The International Space Station (ISS) crossed in front of the sun disc as seen from my observatory this afternoon (24 March 2011) at 11:00:16 UTC (12:00:16 CET). 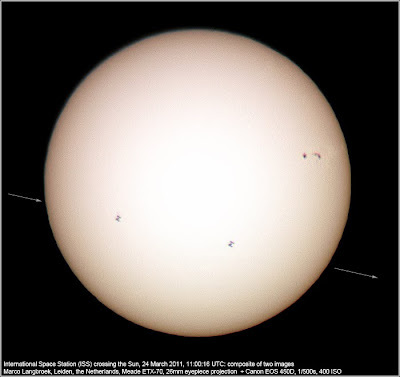 I used my modest 7-cm refractor (Meade ETX-70) to capture it: I started a series of rapid images (My EOS 450D takes 3.6 images/second) one second before the predicted pass time continuing for 5 seconds, and two out of this series show the ISS silhoueted againts the sun, with solar panels recognizable. 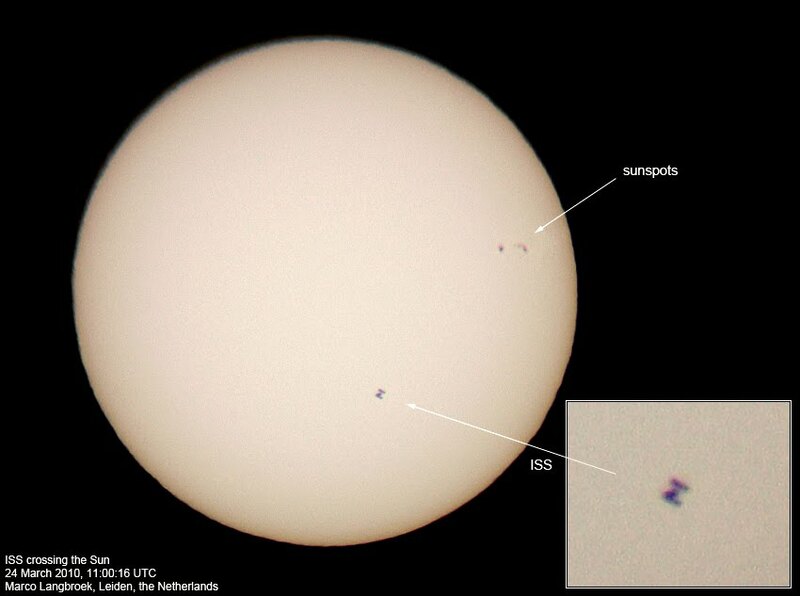 The images also show a group of sunspots. Below images are a single shot (with detail of the ISS at full pixel level), and an image which is a combination of the two images showing the ISS (hence the ISS silhouet shows up twice). The telescope was equipped with a Solar Screen filter, exposure time was 1/500s at 400 ISO, eyepiece projection with a 26mm eyepiece to get a decent sized sun image (with f=350mm in the primary focus the sun disc stays a triffle too small). 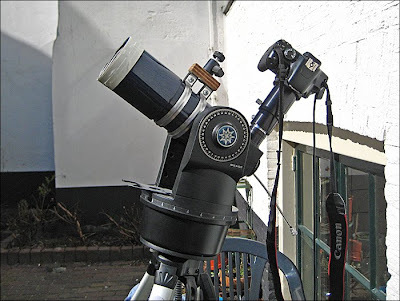 Note that the telescope involved (see image below: Meade ETX-70 telescope with Canon EOS DSLR camera attached and solar filter on the lens) really is very modest: I bought it for a mere €200,- at the Lidl supermarket! The camera is 3 times as expensive as the telescope. Yet, this simple setup manages to capture it all, even though the images are perhaps not as sharp as you would like (which at least partly is due to air turbulence in the sun-heated telescope tube, by the way).